As Trump praised veterans, spouses of vets are facing possible deportation. While President Donald Trump lauded America’s military might at the White House on Thursday, a group of lawmakers outside the Capitol chastised him for weakening the Armed Forces by deporting veterans and their families. 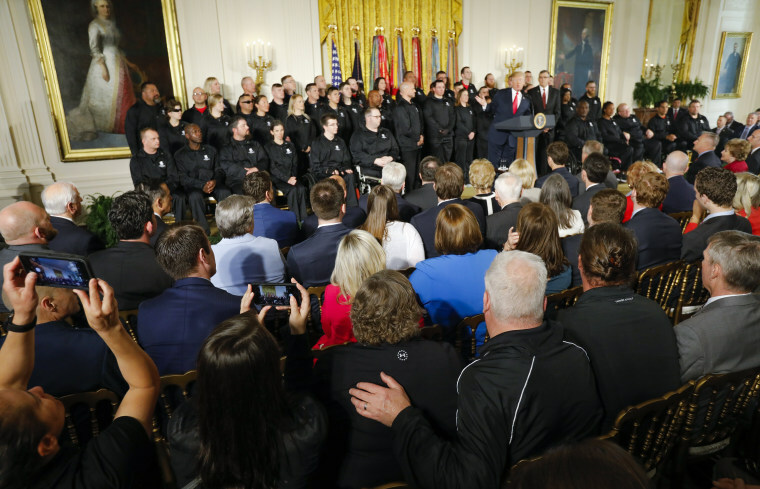 Trump kicked off the annual Wounded Warrior Project Soldier Ride by speaking of the $716 million more he is requesting for the military in the 2019 budget. With that money, “our nation can defeat any hardship, meet any challenge, beat any setback and rise from our trials stronger and more determined by far, by far, than ever before,” Trump said. He referred to the vets on stage with him as "winners." "This is not a stage of those who gave in," he said. "They don’t know what those words mean." But outside the Capitol, Estela Juarez, 8, the daughter of a decorated former Marine sergeant, Cuauhtemoc “Temo” Juarez, pleaded for Trump to stop the hardship that her family is facing — the scheduled June 21 deportation of her mother, Alejandra, Juarez's wife. Cuauhtemoc Juarez, a U.S. citizen, was an infantryman who served from 1995 to 1999 in the 1st Battalion and 8th Marine Regiment. He served in Albania, the Congo and South America, and was also deployed to Iraq in 2003 with the Florida Army National Guard, Rep. Darren Soto, D-Fla., said. He and others have requested a review of his case. Alejandra Juarez entered the U.S. illegally in 1998. She has been checking in every six months with Immigration and Customs Enforcement, according to Soto’s office. She and her husband have been married since 2000. She said during the news conference that her husband had voted for Trump. ICE spokesman Nestor Yglesias said Alejandra Juarez had claimed to be a U.S. citizen when she tried to enter the U.S. from Mexico on May 21, 1998. ICE issued her an "expedited order of removal". Then, two days later, she tried again to cross the border, saying she was a U.S. citizen, but withdrew her request. Yglesias said she entered illegally successfully at some point later. ICE arrested her in August 2013 on immigration violations that it did not detail in its statement and informed her that her previous removal order was being reinstated. ICE released her on an order of supervision and granted stays of removal in August 2015 and August 2016. "At this time, Juarez must comply with her final order of removal," Yglesias said. Her attorney Stacey Bradbury said since illegally entering the country, Alejandra Juarez has been an "upstanding member of society and raised a family" and has helped make her husband's service to his country possible. "When she married her husband, he was a military person and she maintained a home while he did his tour. Someone has to recognize this is what spouses do," Bradbury said. "We want her to be fixed and taken care of, but (deportation) hurts the family. This husband sacrificed and committed himself to the country. The government calls, he's running ... he needs his family intact. You are a veteran for a moment. What if he gets called back? He needs someone to take care of his family." The Juarez family members are constituents of Soto, who has introduced legislation to prevent military spouses from being deported. Our Members are demanding that the Trump Administration stop deporting active military & veteran spouses. Military families give everything for this country, we shouldn't tear them apart. At least 11,800 people now serving in the military have a spouse or family member facing deportation, according to data provided to Soto’s office by American Families United, a group that advocates for the families. During the administrations of Presidents George W. Bush and Barack Obama, officials allowed spouses of military personnel to “parole in place” — essentially remain in the country while they worked out their immigration status. The Trump administration previously has said it has stopped exempting anyone from federal immigration law. Juarez was one of several families who contacted the Military Times about the potential deportation of a spouse after the newspaper reported that the spouse of a Special Forces veteran had been scheduled for deportation. That deportation was scuttled after the publicity. Trump was facing other bad news regarding veterans on Thursday. Separately, his nominee to head the Department of Veterans Affairs, White House physician Ronny Jackson, withdrew from consideration amid allegations of drunkenness on the job and improperly providing prescriptions. Jackson has said the allegations are untrue.